Alright I have been wanting to make a post about this for weeks now so here it finally is, yay! 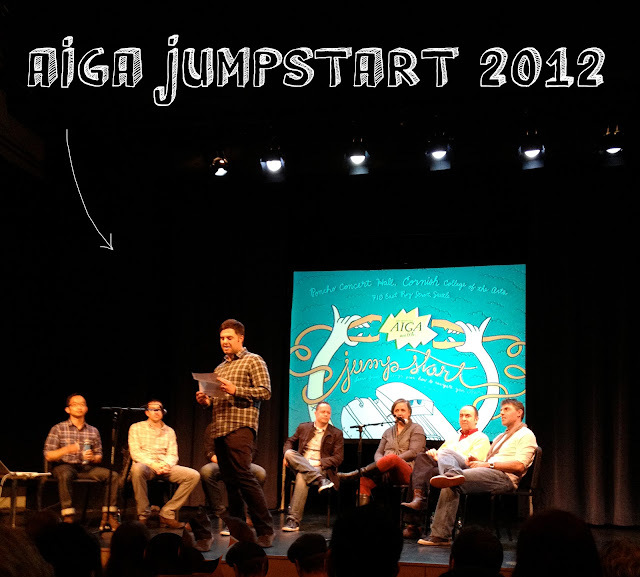 I recently (three weeks ago) attended an AIGA event in Seattle called Jump Start. Every year creative directors from around the Seattle Area donate their valuable time to speak to students about life after college and designing in the "real world". It is extremely helpful to hear what they have to say, and I wanted to share some of that with you! They all seemed to agree that they were looking for in an employee, the "athlete driven type" they all want someone who is highly motivated, can follow through with projects and finish things in a timely fashion. You need to be able to understand business and be able to talk about it, be able educate the client, and help a client see your vision, but also help them bring theirs to life. They expect a high level of independence, they want to be able to give you a job and you can accomplish it without having to ask them a million questions. Also if they give you a job and ask for one comp, make another option or two, just to give clients a variety and do it without having to be asked. CONCEPT CONCEPT CONCEPT, everything needs to be there for a reason, no decorating...anyone can decorate but the designer needs to be a critical thinker. Know about other things besides design, be interesting. You need to have a passion and taste for design. When making/showing a portfolio make sure that the portfolio doesn't out shine the work inside. Only show your best pieces. Haha on this note, they also mentioned not to make your portfolio out of sour dough bread also do not send a bag of spaghetti with your portfolio and don't do anything that is insanely crazy. They all said less is more. You do not need to explain in detail every project in your portfolio. When writing a cover letter "put a lot of time into making it short" They all mentioned that because they have so many resumes and cover letters to read, they want you to keep it the cover letter short and sweet, non of that run of the mill, "how valuable you will be" stuff. Always ask questions about the firm, that way they know you are educated about what they do, and want to know more. It shows you are interested! So those are just a few of the notes I took, I learned a lot and I hope this helps you students reading this as well! If you have a chance to go to an AIGA event you should!